Since there is a lot of misconception on how different SharePoint components relate to each other, I will try to answer some common questions. Please feel free to comment or ask additional questions in the comment section. I will add them to the FAQ list. The below figure shows the infrastructure of Content databases related to Web Applications and site collections. 1. Can we create a site collection in a specific Content Database? 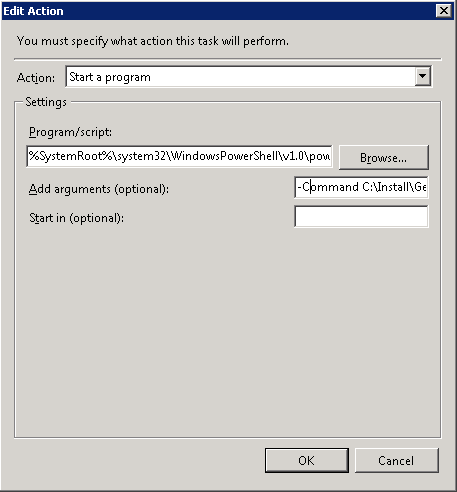 Yes, but you can only do this by using PowerShell using the New-SPSite cmdlet. You can use the "-ContentDatabase" parameter to specify in which Content Database the site collection will be created. 2. When using the "-ContentDatabase" parameter in the New-SPSite cmdlet, does the content database get automatically created if it does not exist? No, if you enter a Content Database name that does not exist, you will get an error saying the content database could not be found. 3. My site collection is getting very big, can I add a second Content Database to spread the load? 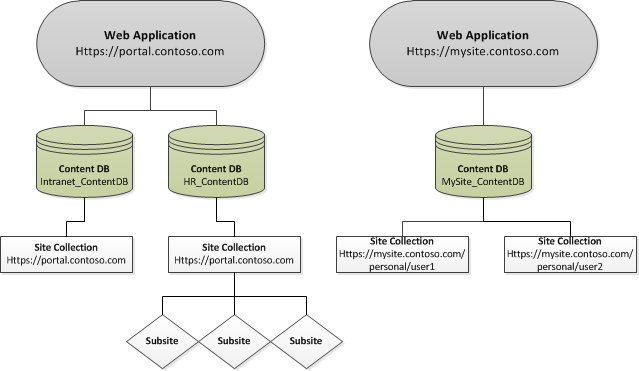 Because of the way SharePoint is designed, you cannot have 1 site collection spread over multiple Content Databases. If you want to split up your site collection in to multiple site collections, you can do this by exporting and importing subsites, or by using 3rd party tools. 4. What site collections are currently in my Content Database? 5. How can I check the size of my Content Database? 6. What Content Databases are attached to my Web Applications? 7. Why are my Content Databases named WSS_Content_<Guid>? The moment you create a Web Application, you will be asked to fill in details regarding your content database. By default, SharePoint will fill in this field for you with the following syntax: WSS_Content. If a content database with this name already exists, it will add a GUID to it. 8. What if I want to move my site collection to another Content Database? You can use the Move-SPSite cmdlet to move the site collection. You can use the Backup-SPSite and Restore-SPSite functionality to accomplish this task. 9. I have multiple site collections in my Content Database, can I use PowerShell to see their sizes? 10. Is it possible to maintain the same Content Database for more than one Web Application? No, this is not possible. A Content Database can only be attached to a single Web Application. Move-SPSite : Cannot insert duplicate key row in object ‘dbo.AllSites’ with unique index ‘Sites_Id’. The duplicate key value is <GUID>. Database 1 contains a site collection with the following URL: http://portal.contoso.com. So far so good. Now let’s say you want to move this site collection back to Database 1. This is happening because the site collection has not been completely deleted from the content database. When you run Move-SPSite, the site collection gets moved to the new content database. However, the site collection in the source Content Database was not completely removed. The site collection "Deleted" flag was set to 1. After you ran the Gradual Site Delete timer job, you will be able to move the site collection back to Database 1. This will be a very short post, as it contains only 1 line of PowerShell code, and is not very hard to understand. It shows you all content databases, and for each of the content databases, it will show you the site collections within this content database. That wasn’t so bad right? Just copy and paste this code into your SharePoint 2010 Management Shell (As administrator), and let PowerShell do your work for you! Now let’s say you want to save this output to a .txt file, you can add “> C:\sitecollections.txt”. The script will create a report of all Web Applications and the associated Content Databases. It will tell you how big each Content Database is in GB. The result will be saved in a .txt file. Optionally, you can send this .txt as an attachment in an e-mail. If you are using this script to mail the report, you might want to add a body to the e-mail, so you can make it look better, but this is not included with the current script. I designed the script so it is easy to schedule as a task. 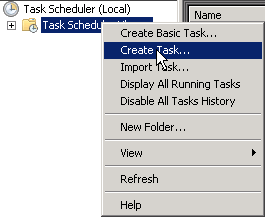 Before you go ahead and schedule it in the task scheduler, you have to add values to some optional and required parameters, For instance, if you want to e-mail this .txt file, you should add at least a SMTP Server, subject, the mail from address and the send to address. 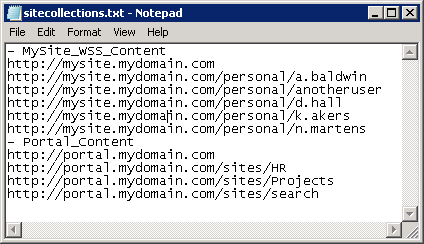 $date = Get-Date -Format "dd-MM-yyyy"
$subject = "Content Database size reports"
$emailBody = "Daily/Weekly/Monthly report on Content databases"
Add-Content -Path $TXTFile -Value "Content databases for $($webapp.url)"
Add-Content -Path $TXTFile -Value "- $($ContentDatabase.Name): $($ContentDatabaseSize)GB"
Write-Host "No e-mail being sent, if you do want to send an e-mail, please enter the values for the following variables: $SMTPServer, $emailFrom and $emailTo." 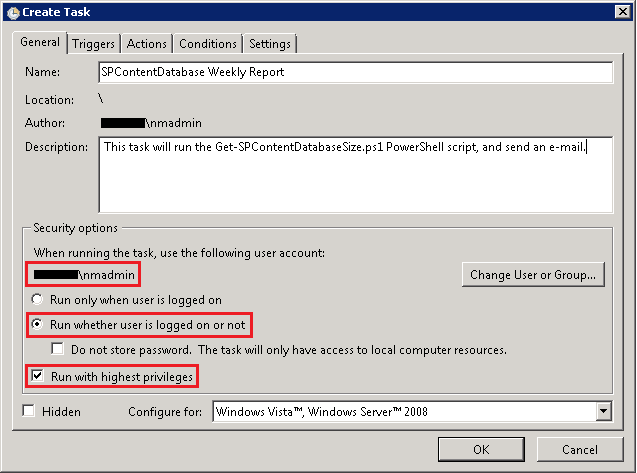 – “Run whether user is logged on or not” should be checked. – Run with highest privileges has to be checked. The triggers can be set to your requirements, in this example I scheduled the task weekly at 6PM. To run a PowerShell script as a scheduled task, you cannot simply add the C:\Install\Get-SPContentDatabaseSize.ps1 in the “Program/script” field. Click OK and enter the password for the account that is running the scheduled task, and VOILA.